Cute short story about a penguin family. Adorable book perfect for toddlers up to K.
This entire book felt like it was desperate to meet a page count. It takes FOUR pages to say "Snowflakes? Many snowflakes." And guess what - we have to go through "Mittens? Many mittens." (Just two pages) and then after a bit we get "Deep. Deeper. Very deep" in another FOUR pages. Truth be told, pretty much the entire book is done BETTER on the front jacket flap: "Snowflakes? Yes. Mittens? Yes. Scarves? Yes. Boots? Yes. Fun? Yes! Let's go!" Now you know the book, and you can skip it and save the $17.99. The illustrations are no great shakes. The endpapers are more interesting than the book itself. Even the dedications are dull: "For Sylvie - C. Rylant" "Also for Sylvie - C. Robinson" - give me a break. Someone needs to raise the bar higher. VERY simple text. I kept thinking, "I could write a book like this!" I think I might have liked this better as a wordless book. The illustrations aren't my favorite, but they do have some nice details and also do most of the work telling the story. I'm clearly not the target audience. I can see it as a favorite for toddlers who learn a book and then like to "read" it to themselves and others. It would also work well in a library storytime. With sparse, rhythmic text and a limited palette accented with bright pops of rich color, Rylant and Robinson have created an ode to winter that will warm your heart to its core. Robinson’s visual nods to classics like A Snowy Day are delightful, and Rylant’s conversational tone is perfectly matched with the audience. A perfect read aloud for the youngest readers, especially if paired with warm cookies, sippies, and cozy, warm blanket to snuggle. Love this book! Cute book for winter!! Five little penguin siblings head out into the snow on the first day of winter. There are many snowflakes in the air while they put on mittens, scarves and boots. The snow is very deep by the time they get dressed and outside. They play in the snow and then head back inside where they pull off their winter gear, put their pajamas on, have warm cookies and sippy cups. That night, they are warm in bed but one of them is still looking out the window at winter arriving.Newbery Award winner, Cynthia Rylant has written this book with exactly the right amount of text for toddlers and young preschoolers. There is a lovely loose rhythm to the words, an excitement of new falling snow that is generated on the page. The rush to get ready, the enjoyment of their time playing outside and the warmth of returning inside to coziness is all nicely captured. Children who love snow themselves will recognize their days in these little penguins.Robinson’s illustrations make this book very special. His bold colors, strong shapes and use of space create a lot of drama on the page. The way that each little penguin has their own color adds an element that parents and teachers can use to talk about the book. There is also the chance to count to five again and again. The huge flakes of snow are a delight to the eye, creating a feeling of joy and wonder on each page.A toddler-friendly picture book, this is a cheery book celebrating the coming winter. Appropriate for ages 2-4. Sorry to say that this picture book didn't hold the charm that I was hoping it would. There isn't really much of a story to it, and no alliteration or rhyme to catch a child's attention. There is a little repetition, but overall, writing-wise, I found this book to be unfortunately lacking.The art is a simplistic style that I enjoyed, with colors toned down nicely to fit with the winter theme of the book - all except for one two-page spread that is a sudden burst of colors, to the extend that it really jars a viewer and seems very out of place for the rest of the book.I've really been enjoying exploring picture books lately, but I would not recommend this particular one. What a great author/illustrator duo. Christian portrayed the penguins in a unique way. The text is so easy that new readers will have no problems connecting with the story. My favorite part of the story is when all the little penguins come back inside after playing in the deep, cold snow. You won't be able to help chuckling when you get to that part. This is the perfect picture book to read to a toddler! Very simple text and big, bold pictures make it visually appealing. There are subtle opportunities to count and to talk about colors and seasons, but you can read it just for fun, too! What a perfect book for a preschool classroom in winter. The illustrations are inviting and the storyline gives many opportunities for discussion. I like the text and the pictures are cute, but why would penguins need any of these things, esp. a sled? I think sliding on your belly is one of the best parts of being a penguin?! 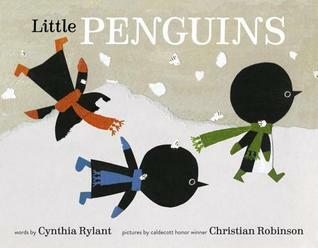 A wonderful tale by Cynthia Rylant about an igloo full of little penguins who want to go out and play in the snow. *I read a digital ARC of this title from the publisher via Edelweiss. Excellent winter book for story times! This is a book about a family, including five young penguins and their parents, who are excited for the beginning of winter. The young penguins, after realizing it was snowing, decided to go outside and play. They put on their mittens, scarves and boots, and headed outside. They played in the deep, deep snow with their mother until they became cold, then went back home, took off all of their winter gear, ate some cookies, drank out of their "sippies," and went to bed. The end.I suppose this would be a cute book to capture a young, preschool child's attention, who would enjoy playing in the snow, and reading about cute, little penguins. Preschool children may also relate to the penguins because, they too, enjoy cookies and drinking out of their "sippies" on a cold night, after having played in the snow. More critically, the story is appropriate for young children as its simple use of vocabulary appeal to them, and as a short book, children are more likely to listen to the full story. As an adult, I did not enjoy the book's lack of climax. What was so special about this book? Why would I want to read it to my class? Does it introduce an academic lesson? How about a life lesson? But a preschool book, it works perfectly. Five little penguins discover it's snowing! It takes them a while to gather the necessary clothing to go outside. Each little penguin has its own set of mittens, boots and scarves, each in its own color. Finally ready to go outside they revel in the deepness of the snow, sliding down the hill on their bellies. Mother finally joins them by sliding down the hill herself.And once it becomes to cold to continue everyone trundles home for cookies and milk. Then it's into bed for the littles.The acrylic paint and cut paper collage illustrations are enchanting and mesmerizing. The story is told in few words making this a great book for toddlers. This will be a hit! This book is about five little penguins watching the snowflakes, and getting ready to go play in the snow. They are gathering mittens, scarves, socks, and boots to put on and go play in the outdoors. The snow is deep, and getting deeper. Mama comes along with the one little penguin. It is cold, and time to go home. When they get home they take off all their winter gear. The five little penguins put on their jammies, and wait for their warm cookies. Winter is here, and it is time for bed. I thought this was a cute little story. The illustrations are cute as it gives you a visual of the penguins playing in the snow. I liked the book. It was short and sweet. The book spoke about winter and how the penguins got ready to play in the snow. The illustrations made the book better, so you could see how the penguins enjoyed playing in the snow. One illustration I liked the most was a penguin in a red scarf and gloves that was head first in the snow. When I read this book to my students they laughed when they say this illustrations. Overall, the book is a good read to introduce winter and get your students talking about how they dress in the winter time or what they like to eat or drink to keep them warm. This book is about a family of penguins getting ready to have a fun day in the snow. Winter has finally arrived and the penguin family couldn’t be happier. They get on their scarves and mittens and go out to have a fun day in the snow.I like this book because it had very cute pictures. The illustrator used torn paper to create a winter wonderland for the penguins to play. The story was also cute and sometimes very funny. I think this would be a good book to read in a preschool or kindergarten class during the winter. It would be a great addition to a unit on seasons. I can see how the minimalist text could be appealing (but wordless would be even better). I can see how the illustrative style has a certain charm. But the whole thing is rather bizarre. Five little penguins and one mom live in an igloo, need boots to go outside, and need warm cookies when they go inside. Wtf? Make them ermines or badgers, something like that, at least, to eliminate some of the dissonance....I've loved lots by Rylant and will look for others by Robinson, but this is just ridiculous. Pretty unimpressive overall. I love Christian Robinson's illustration style--that hasn't changed. The images are still very nice, and based on his previous work that I liked, this remains a nice book to look at.However, I really think this book would've benefited from having actual children as the characters, instead of these penguins. I understand that then it wouldn't really be "Little Penguins" anymore, but as it is, I think it's significantly lacking in content. Anthropomorphized animals are abundant to the point of absurdity in children's literature, and all I could think of was this infographic about diversity in children's books, which shows animals/trucks as the second leading stars of books meant for young readers. So, with that, I really do think this book would've been more special if there were actual children in it. Penguins are great and all, but so are kids. Although I'm sure that Little Penguins is intended for the youngest of readers or read-to-me types, everything about this book seems overly simplistic, from the sentences to the illustrations. That's not to say that there aren't some cute things going on, but just enough to make this book "ok". This is a story about five little penguin siblings that are enjoying the first snowfall. They get all dressed up and go outside and have n amazing time adventuring with the snow. After they are finished, they go inside and get nice and warm. They eat warm cookies and drink hot chocolate. This story is really limited on words and would be good for toddlers and pre-K. This is an enjoyably quirky book with penguins at the coming of winter. Round-headed penguins? It adds to the feel. With scarves and mittens and boots? What else would you wear in such cold? Robinson's illustrations are really inventive and nice mix of acrylic and cut paper that makes simple figures expressive. Decent winter themed picture book as long as you're aware that there's less than 100 words in it, with most sentences being two or three words long. I think this is more appropriate for babies or for very beginning readers. Wonderful story about a family of penguins. They have to have certain things to go in the snow. Each penguin a different color. Great to help children understand what clothing to wear in snow as well as colors. I thought this book was cute especially for a younger audience--those still using sippy cups. It has beautiful illustrations and is good to discuss colors, snow, and clothes. However, my younger audience didn't seem very plussed by it. A family of four little penguins are getting ready to play in the new fallen snow. Sparse text, delightful illustrations and sure to please the youngest wanting to read about the snow experience from dressing for it to playing in it. The penguins look more like little kids than penguins and there's no real rhyme or story line to catch the kids' attention. Honestly, the text is so sparse it could have been written by a young child. For such a powerful writing/illustrating duo, I'm completely underwhelmed.